Every year, Nintendo releases what essentially becomes the shopping list for gamers. The company’s recent Nintendo Direct session, where they listed off all the games and products set to be released over the current year, has a ton of stuff in store that will surely put a dent in your wallet. One of the hottest items on this list is the Legend of Zelda: Majora’s Mask remake for the 3DS, as well as its exclusive 3DS XL model that looks just as amazing as the exclusive Ocarina of Time edition released last year. Another big must-have is the newest installment of Capcom’s action-RPG series: Monster Hunter 4 Ultimate. Between new weapons, monsters, and areas to explore, players will also have the ability to fight while climbing giving them a new sense of movement for certain battles. However it is not just the 3DS that will be getting new games, as the Wii U will also be getting its fair share from the insane-looking shooter Splatoon to Mario Party 10, which now stars not only the Mario characters, but also some characters from the beloved Sonic the Hedgehog titles. These titles though are only a drop in the bucket when it comes to the many great things to be expected from Nintendo this year. In fact here is a list of some of the other items that are scheduled to be released. · New Nintendo 3DS and New Nintendo 3DS XL: In addition to the new control options, super-stable 3D technology and built-in NFC functionality, New Nintendo 3DS and New Nintendo 3DS XL also feature an increase in CPU power, allowing for faster download speeds and use of Miiverse, and smoother transitions when switching between software. New Nintendo 3DS and New Nintendo 3DS XL systems launch on February 13th. · The Legend of Zelda: Majora’s Mask 3D: The handheld remake of the beloved Nintendo 64 game launches for Nintendo 3DS and 2DS systems on 13thFebruary. Launching on the same day is the New Nintendo 3DS XL Majora’s Mask Edition hardware bundle, including a Majora’s Mask-themed New Nintendo 3DS XL and a copy of the game*. Players who experience the dark and twisted adventure on New Nintendo 3DS or New Nintendo 3DS XL can enjoy the super-stable 3D and enhanced camera controls using the C Stick. · New Fire Emblem game: A new game in the Fire Emblem series is coming to Nintendo 3DS and 2DS systems. Developed by the same team who created Fire Emblem: Awakening, the new adventure adds challenges never before seen in the series and asks players to make decisions that will affect the game’s world in new ways. More information on the game’s release will be revealed in the future. · Monster Hunter 4 Ultimate: As players explore the world of Monster Hunter 4 Ultimate, they will face off against many ferocious enemies with up to three other friends locally or, for the first time on Nintendo 3DS, online using a wireless broadband Internet connection. Starting today, an exclusive demo with three different quests and local and online multiplayer functionality will be made available by email to select Monster Hunter fans, complete with three additional Nintendo eShop codes that can be shared with friends. A special edition New Nintendo 3DS XL bundle that includes a slick, custom-designed system and theMonster Hunter Ultimate 4 game** will also release on the same day. By playing the game on New Nintendo 3DS or New Nintendo 3DS XL, players can experience C Stick functionality and super-stable 3D that makes for more immersive gameplay, while two sets of cover plates inspired by the game will be available for New Nintendo New-3DS-Screenshot-013DS owners to purchase separately from 13th February. · Super Smash Bros. for Nintendo 3DS amiibo Compatibility: In February, a new system update will allow amiibo support for Super Smash Bros. for Nintendo 3DS using the Super Smash Bros. series of amiibo and the NFC technology built into New Nintendo 3DS systems. The previously announced Nintendo 3DS NFC Reader/Writer for amiibo support on Nintendo 3DS will launch in the future. · Xenoblade Chronicles 3D: On 2nd April, a remake of the well-receivedXenoblade Chronicles for Wii is launching exclusively for New Nintendo 3DS and New Nintendo 3DS XL systems. The new version offers 3D visuals and allows players to view the maps and character stats on the bottom screen. Another new addition to the game is a bonus mode that lets players view 3D models of the characters and listen to tracks from the game’s musical score. · IronFall: Invasion: Created by a small team of three talented indie developers for Nintendo 3DS and 2DS systems, IronFall: Invasion brings fast-paced shooting action, with the gameplay perfectly suited for using the C Stick of New Nintendo 3DS and New Nintendo 3DS XL. With 6-player local and online multiplayer, a dedicated single player campaign and 60fps gameplay, this new title from VD-Dev is releasing on Nintendo eShop for Nintendo 3DS in February. · Puzzle & Dragons Z + Puzzle & Dragons: Super Mario Bros. Edition: Based on the popular Puzzle & Dragons game – a puzzle game with RPG and strategy elements that previously launched in Japan – Puzzle & Dragons Z and Puzzle & Dragons: Super Mario Bros. Edition will launch as one package for Nintendo 3DS and 2DS systems in May. Puzzle & Dragons: Super Mario Bros. Edition features characters and worlds from the Super Mario Bros. series. · Code Name: S.T.E.A.M. : On 15th May, Abraham Lincoln will bring together a team of talented agents to fend off an alien invasion. Code Name: S.T.E.A.M. will support amiibo figures. Players can use Fire Emblem amiibo characters Marth, Ike, Robin and Lucina as playable characters in battle and unleash their Fire Emblem-related weapons against the aliens. · Pokémon Shuffle: Launching on Nintendo eShop for Nintendo 3DS in February, Pokémon Shuffle finds players matching three or more Pokémon to clear them from the screen and finish stages. Players can download and start the game for free and purchase in-game items using Nintendo eShop funds. · ACE COMBAT ASSAULT HORIZON LEGACY +: Coming in February 2015 for Nintendo 3DS and 2DS systems, play as the legendary pilot Phoenix and control fighter jets that actually exist in real-life. The game includes compatibility with the New Nintendo 3DS system’s C Stick and ZR/ZL buttons for total control, while also offering amiibo support with unlockable jets styled on characters such as Link, Bowser or Fox. · Nintendo Anime Channel: A new video-on-demand service kicks off on 13thFebruary, offering fans the chance to stream anime series from the likes of Pokémon, Kirby, and Inazuma Eleven, with new content being added regularly. Access to the service is granted simply by downloading a free application from Nintendo eShop. · Splatoon: When players first start the colourful shooting game, they will begin in a central ‘plaza’ that connects to all the different modes in the game. The hub also grants access to a shopping centre that lets players customise their weapons and outfits. Splatoon launches exclusively for Wii U in May. · Captain Toad: Treasure Tracker: A new update on 20th March will add amiibo support to the charming Wii U game. Players that tap the Toad amiibo – releasing on the same day – to the GamePad can enjoy a new hide-and-seek mode where pixel art Toads are hidden throughout the stages. · Xenoblade Chronicles X: The upcoming Wii U game is an open-world RPG that allows players to seamlessly explore a vast world. Xenoblade Chronicles X is planned for launch in 2015. · Project Treasure (working title): A new teaser video was revealed in today’s Nintendo Direct featuring Katsuhiro Harada from Bandai Namco Games discussing a new game that is being developed exclusively for Wii U. The game will be free to download and start playing but requires an online connection as four players work together to complete varied stages, clearing traps, routing enemies and seizing treasure. · Wii Games Coming to Wii U a download software: Starting today, players will be able to download Wii games directly to their Wii U HOME Menu via Nintendo eShop for Wii U – no need to access Wii Mode. The first game that is available – released today – is Super Mario Galaxy 2. The future lineup of Wii games coming to Nintendo eShop on Wii U includes Donkey Kong Country Returns (22nd January) and Metroid Prime Trilogy (29th January). Other upcoming titles are Kirby’s Adventure Wii, Pandora’s Tower, Sin & Punishment: Successor of the Skies and Punch-Out!!. The Wii U GamePad can be used to control many Wii games that were compatible with the Wii Classic Controller. 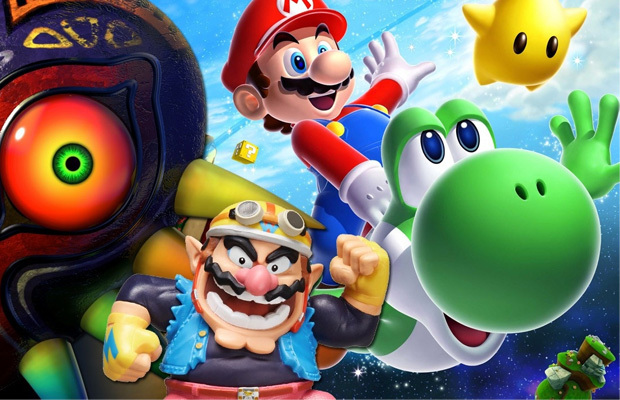 Super Mario Galaxy 2, Donkey Kong Country Returns and Metroid Prime Trilogy will be on sale. · Super Mario Collection amiibo: A line of amiibo inspired by the characters of the Super Mario series will launch on 20th March. The lineup includes new models of Mario, Luigi, Peach, Yoshi and Bowser, as well as the introduction of Toad. Crossover amiibo characters from the Super Smash Bros. and Super Mario lines like Mario, Luigi, Peach, Yoshi and Bowser will have the same functionality in all compatible games, so players can choose which design they like best! · Additional amiibo Figures: Robin, Lucina, Charizard, PAC-MAN, Wario and Ness amiibo figures, which are all compatible with Super Smash Bros. for Wii U and – when amiibo functionality becomes available in February – Super Smash Bros. for Nintendo 3DS, will launch on 24th April. · Mario vs. Donkey Kong: Tipping Stars: In this puzzle/platformer hybrid, players guide Mini Mario toys to the exit door using touch control. As with previous games in the series, players can create their own levels and share them with other players online. In this game, players can “tip” the creators of the user-generated puzzles with stars, which can be used to buy new parts in the robust level creator.Mario vs. Donkey Kong: Tipping Stars will be available as a download code at retail, or directly from Nintendo eShop for both Wii U and Nintendo 3DS on 20th March. As a bonus, players who purchase the Wii U version will receive a free download code for the Nintendo 3DS version, and vice versa.